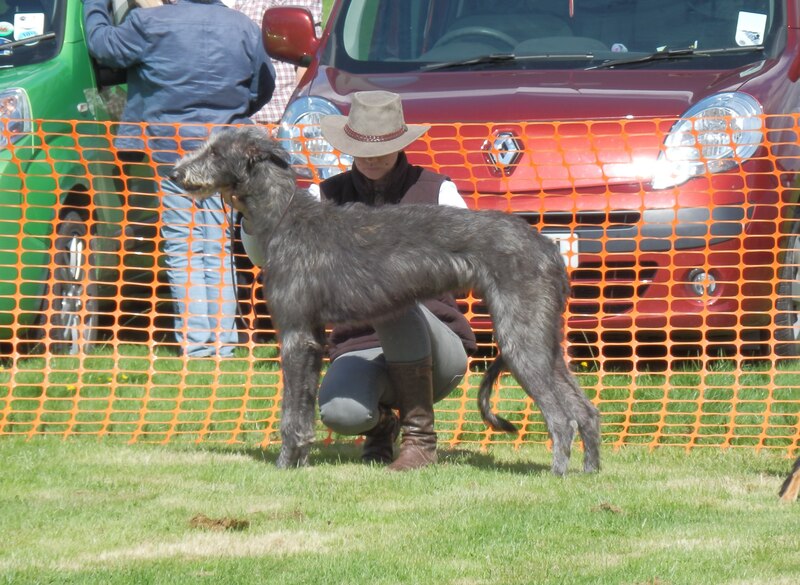 And a photo of Brylach Ophelia of Sorimsway performing well in the ring. Meanwhile, although in a lot less glamorous surroundings, please see below a photo of Ronan (Cusidh Homecoming). Ronan is pictured here in the SKC car park following his win in Limit Dog. Ronan will be three next month and we feel is maturing into a lovely hound. Ronan is by Leoch Fiddich x Riding the Wind to Cusidh. Finally, we were delighted to hear that Kessoch Marsco of Greystiel (a further daughter of Cusidh Righ Innse Gall) owned by Anne Smart received her first Reserve Challenge Certificate at the Scottish Breeds Championship show from Judge David Murray. Congratulations.